Think about this. WeWork, HubHub, Business Link, Spaces. All entering Czech market in the second half of 2018 alone, not forgetting Impact Hub launched it’s second biggest branch globally here earlier this year. Business Link, an operator active mostly in Poland, will open up to 40,000 square meters in coming two years. That’s not random. I recently visited the CEE Summit organized by Property EU and Poland Today magazine and what striked me again was how CEE is already progressive on topics that push boundaries in real estate. In the breakout session that covered current trends, people were mentioning how they enjoy being in coworking. As a reason for that, people were mentioning flexibility. One of the participants said that he does not mind going to the office during the weekend (if he has to) that much compared to his former (traditional) office. But it is not flexibility or physical amenities like humming coffee machine – although they’re super convenient, don’t get me wrong – what’s appealing at coworking spaces. The number one reason is… people. Humans are by nature social beings. Events, more breakout opportunities and random conversations in kitchen. That’s where ideas are born. Interestingly, participants of that conversation at the CEE Summit did not mention community in particular straight away. But when suggested, they all agreed it’s the key factor. What does this say? We think about community as something natural – but actually, it’s not easy to build it up from random herd of people. According to CBRE 2018 Occupier Survey, more than 80% of tenants perceive amenities as integral to the employee experience and 65% think service-oriented amenities are more important than fixed space-based amenities. Delos, the founder of the WELL standard, is right when it stresses that creating a culture of health and wellness in which employees actively participate is more than providing a gym and healthy items in the cafeteria or introducing a corporate challenge. 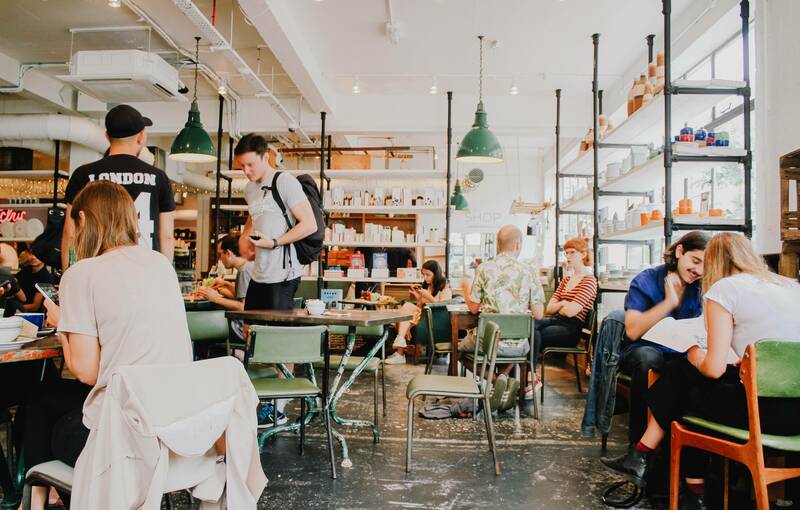 In another survey, respondents claim that they want their workspace to feel more like a community and that they expect landlords will participate in providing this experience. That’s where flexible office spaces win it all with their workshops and social events and that’s also why at Spaceflow, we introduce real estate to reasoning on why we think curated content and community managers driving the engagement of people are so important. But for quite some time it looked like landlords and developers were rather sceptical about this flexible office trend and if they were to embrace it, then they rather acquired a seasoned provider who specialises in that. Now we see they build it themselves without much hassle. In CEE, HB Reavis made a very clever move by starting a new brand, HubHub. Skanska wants to acquire up to 50 % of Business Link’s shares. In the US, Tishman Speyer has launched Studio. And even CBRE recently launched its own coworking brand, Hana, in the US and one cannot doubt they’re rolling-out to CEE soon. 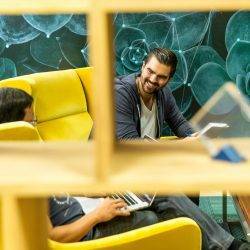 “We see it expanding to 15% or 20% of the (global) market,” says Andrew Kupiec CEO at Hana but as Coworking Mag suggests, catching up with other players will be tough when you have competitors like WeWork, Regus and Knotel who have hundreds coworking spaces already. Also, both Knotel and WeWork just announcced new rounds of funding: $60 million (Knotel) and $3 Billion (WeWork) to accelarate their growth. Although real estate owners are more than aware of some level of uncertainity – as participants of the aforementioned CEE Summit agreed, providing 100 % of all their assets as coworking spaces is too risky – it is not a coincidence that traditional real estate players are now moving into coworking business in CEE at the same speed or at even more rapid pace as in other regions. Time will tell who’s going to be the winner but Asia Pacific region, where coworking is gaining its true momentum, future-proofed that developers are successful with coming up with their own brands. But what are the reason of popularity of flexible offices except of the power of community and amenities? A typical small business life span is 4 years. 4 years! Average life span of 500 Fortune company has dropped from 60 years in 1950s to about 15 years now. 99% of London companies employ less than 50 people. The simple truth is nobody can predict 5, 10, let alone 15 years ahead in this rapidly changing economy. 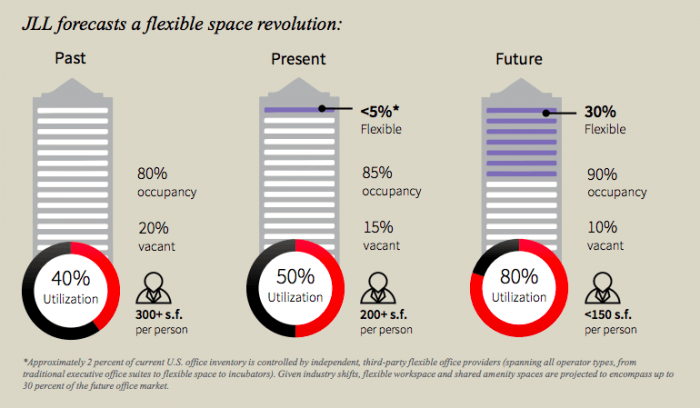 As JLL puts in its 2017 Flexible Space report, “most organizations only have 24 months of revenue projections and 36 months of strategic planning”. Average lease agreement exceeding 5 years significantly is in sharp contrast with this. It’s almost a no brainer for traditional real estate to build coworking themselves when you consider these numbers: CBRE says 45 % of corporations expect substantial to moderate usage of flexible space by 2020. JLL is forecasting revolution by prognosing that by 2030, flexible space will comprise of up to 30% of all offices. But the most staggering number is that 41% (!) of all leased or owned corporate office space in the U.S. is vacant but paid for. The cost of this is roughly 150 billion USD and what is even more surprising is that the percentages are pretty consistent internationally. Something is happening and it’s here to stay. What’s clear is that we need a way more effective approach to how we use spaces, one that is more flexible to evolving business needs. 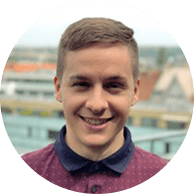 What if you have coffee places with underused premises and people can book a desk through an app for few hours to work, like Czech startup Locco does. Or what if you have restaurants that filled with workers during mornings. This isn’t sci-fi but reality already taking place. It’s all just a question of scale.